WASHINGTON—ESPN’s Monday Night Football commentator Jon Gruden reportedly continued speaking into his microphone for 45 minutes following the conclusion of last night’s Eagles–Redskins matchup, incessantly rambling on about the potential of rookie players, his experiences as an NFL coach, and quarterback throwing mechanics. “I’m telling you, if the Eagles are going to keep running a one-deep, RGIII just needs to look him off and that slot receiver is going to be wide open all night,” Gruden reportedly babbled aloud, standing alone in the darkened broadcast booth overlooking the completely empty stadium as crew members packed the last cases of camera equipment into the production truck. “This kid is something special, and I love watching him go out there and play like he’s having fun. 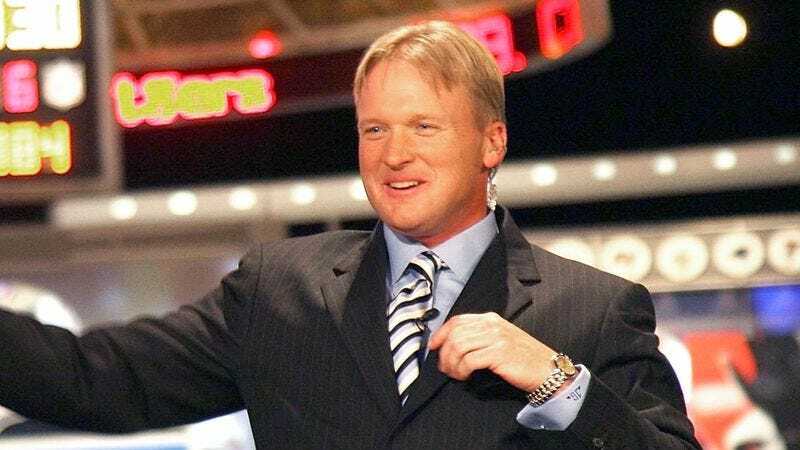 He’s what I like to call a true competitor.” Witnesses confirmed that after the rest of the production team left the stadium, Gruden continued discussing the intricacies of the Eagles’ spread offense as a FedExField janitor attempted to vacuum around his feet.